An Anglo-American poet, born in England, an American citizen (from 1946), and regarded by many critics as one of the greatest writers of the 20th century. His work is noted for its stylistic and technical achievement, its engagement with moral and political issues, and its variety in tone, form and content. The central themes of his poetry are love, politics and citizenship, religion and morals, and the relationship between unique human beings and the anonymous, impersonal world of nature. 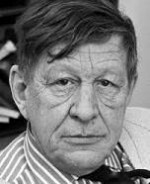 Auden grew up in and near Birmingham in a professional middle-class family and read English literature at Christ Church, Oxford. His early poems from the late 1920s and early 1930s, written in an intense and dramatic tone and in a style that alternated between telegraphic modern and fluent traditional, established his reputation as a left-wing political poet and prophet. In the late 1930s he became uncomfortable in this role and abandoned it after he moved to the United States in 1939. In his poems from the 1940s he explored religious and ethical themes in a less dramatic manner than in his earlier works, and combined traditional forms and styles with new, original forms. The focus of many of his poems from the 1950s and 1960s was on the ways in which words revealed and concealed emotions. He took a particular interest in writing opera librettos, a form ideally suited to direct expression of strong feelings. Following his death in 1973, his memorial stone was unveiled in Poets’ Corner, Westminster Abbey in 1974. He was also a prolific writer of prose essays and reviews on literary, political, psychological and religious subjects, and he worked at various times on documentary films, poetic plays and other forms of performance. Throughout his career he was both controversial and influential. After his death, some of his poems, notably “Funeral Blues” “Stop all the clocks”, “Musée des Beaux Arts”, “Refugee Blues”, “The Unknown Citizen”, and “September 1, 1939”, became known to a much wider public than during his lifetime through films, broadcasts, and popular media. Auden was born in York, England, to George Augustus Auden, a physician, and Constance Rosalie Auden, née Bicknell, who had trained (but never served) as a missionary nurse. He was the third of three sons; the eldest, George Bernard Auden, became a farmer, while the second, John Bicknell Auden, became a geologist. Auden, whose grandfathers were both Church of England clergymen, grew up in an Anglo-Catholic household that followed a “High” form of Anglicanism with doctrine and ritual resembling those of Roman Catholicism. He traced his love of music and language partly to the church services of his childhood. He believed he was of Icelandic descent, and his lifelong fascination with Icelandic legends and Old Norse sagas is visible throughout his work. Auden’s first boarding school was St Edmund’s School, Hindhead, Surrey, where he met Christopher Isherwood, later famous in his own right as a novelist. At thirteen he went to Gresham’s School in Norfolk; there, in 1922, when his friend Robert Medley asked him if he wrote poetry, Auden first realised his vocation was to be a poet. Soon after, he “discovered that he had lost his faith” (through a gradual realisation that he had lost interest in religion, not through any decisive change of views). In school productions of Shakespeare, he played Katherina in The Taming of the Shrew in 1922, and Caliban in The Tempest in 1925, his last year at Gresham’s. His first published poems appeared in the school magazine in 1923. Auden later wrote a chapter on Gresham’s for Graham Greene’s The Old School: Essays by Divers Hands (1934). In 1925 he went up to Christ Church, Oxford, with a scholarship in biology, but he switched to English by his second year. Friends he met at Oxford included Cecil Day-Lewis, Louis MacNeice, and Stephen Spender; these four were commonly though misleadingly identified in the 1930s as the “Auden Group” for their shared (but not identical) left-wing views. 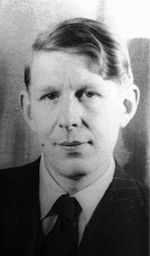 Auden left Oxford in 1928 with a third-class degree. He was reintroduced to Christopher Isherwood in 1925 by his fellow student A. S. T. Fisher. For the next few years Isherwood was his literary mentor to whom he sent poems for comments and criticism. In 1935–39 they collaborated on three plays and a travel book. From his Oxford years onward, Auden’s friends uniformly described him as funny, extravagant, sympathetic, generous, and, partly by his own choice, lonely. In groups he was often dogmatic and overbearing in a comic way; in more private settings he was diffident and shy except when certain of his welcome. He was punctual in his habits, and obsessive about meeting deadlines, while choosing to live amidst physical disorder.